Despite continuing technological advances, there are still many daily living products that are unusable for broad sections of the population, including older and impaired users. Therefore, in order to design more accessible and usable products, designers need better models that can predict how people with varying levels of capability interpret and use different features on product interfaces. 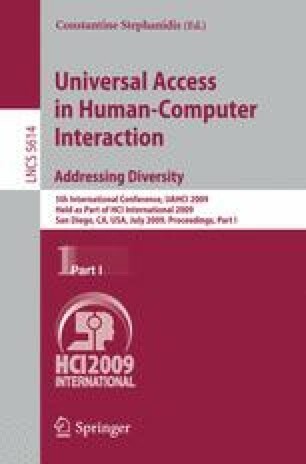 The aim of this paper is to survey the background of modelling product-user interaction, discuss strengths and weaknesses of various approaches and focus on appropriate methodology to investigate inclusive interaction with everyday products. This paper concludes that a model of product-user interaction should include three representations of specific information: (1) what people want to do when operating a product (goals); (2) what people actually do while operating a product (actions); and (3) what happens to the functional parts of the product during the operation (objects). Further research is necessary in order to identify methods for combining goal, action and object approaches and developing a usable and inclusive model of product-user interaction.